This amazing scene is in Brasilia (where else?). 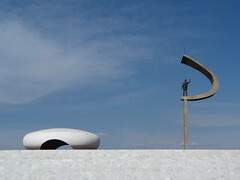 It is the JK Memorial designed by Oscar Niemeyer in 1980 (yes the nineteen-eighties!!!) for the former Brazilian President and founder of Brasilia, Juscelino Kubitschek.